Minakshi De will exhibit within our Booth R103, located at the Main Entrance of the Fair and across from the VIP Cafe & Lounge Area, displaying a variety of media and styles, from Abstract or Geometric to Figurative, from painting to photography, sculpture and ceramic installation. Due to the interesting themes approached by the Artists and the well-balanced curated conception for the presentation of meanings, shapes, and colors, the exhibition will be attractive and significant for the Art Fair visitors of any age and walk of life, as well as a ‘must see’ for the Art Collectors and all the Art Basel Miami Week viewers of this year. Minakshi De obtained in 1980 a Bachelor’s degree in Fine Arts with honors from the University of Chittagong and a Post Graduate Diploma from the Fashion & Art Institute, Dallas, TX, in 1982. Currently, she creates her Art from her studio at Vero Beach, FL. Between 1993-2008 she developed her artistic career in Solo Shows at the Kolkata Academy of Fine Arts, Chitrakoot Art Gallery, Birla Academy of Art & Culture, the Taj Bengal, and Samokal Art Gallery, all in Kolkata, India, as well as at Divine Art Gallery in Dhaka, Bangladesh, Giri Art Gallery in Chittagong, Taj Art Gallery in Mumbai, India, and RAGA Gallery 14, Vero Beach, FL. Selected Group Shows, from 1977 to 20016, were at Shilpa Kala Academy in Dhaka, the Alliance Françoise in Chittagong, and Parishad, all in Bangladesh; at the Academy of Fine Arts, Rabindra Bharati University, Kala Mela, the Institute of International Social Development & Alliance Françoise, Birla Academy of Art & Culture, and the Taj Bengal by Master’s Collection Art Gallery, all in Kolkata, India; as well as in India, at Goa Kala Academy, Nehru Centre in Mumbai, Lalit Kala Academy in Chennai, and AIFACS at Delhi. Other international shows were: in China and in USA, at the Fashion & Art Institute of Dallas, TX, the Crossing Art Gallery presented by the Indo American Arts Council, New York, NY, ART 6 in Richmond, VA, and in Florida at the European Art Gallery, Miami, the Vero Beach Museum of Art, Backus Gallery & Museum in Fort Pierce, Miami Art Fair 2012, the Ridge Art Association Gallery in Winter Haven, the Henegar Center for the Arts in Melbourne, DARBY FINE ART Gallery in Vero Beach, Art-Serve Fort Lauderdale, and the Art Fest @ Doral, Miami, representing INDIA curated by Minakshi De. Minakshi De expands the ‘Feminine’ to a new level in a refined attractive way, merging India’s traditional patterns, feminine mystery, and feelings with her own profound message and contemporary technique. 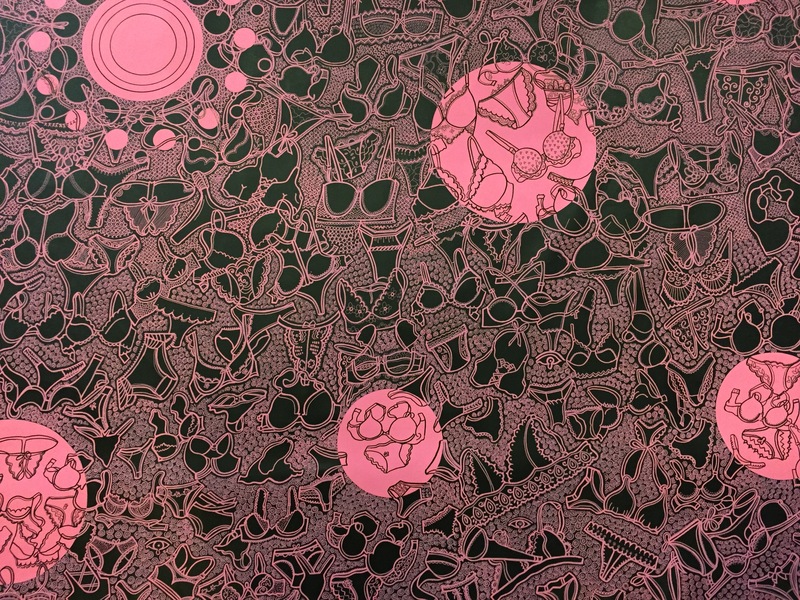 Her new acrylic on canvas of 86” x 66”, entitled Pink World, presented by Contemporary Art Projects at Red Dot Art Fair, depicts the latest path in her painting career, as she masterly merges concept, creativity, innovation and artistic message in a unique astonishing Artwork. For many years her Art has received important Awards and it is today in relevant Art Collections.